A short account of the free speech fight initiated by anarchists on Wanstead Flats in East London in 1891. 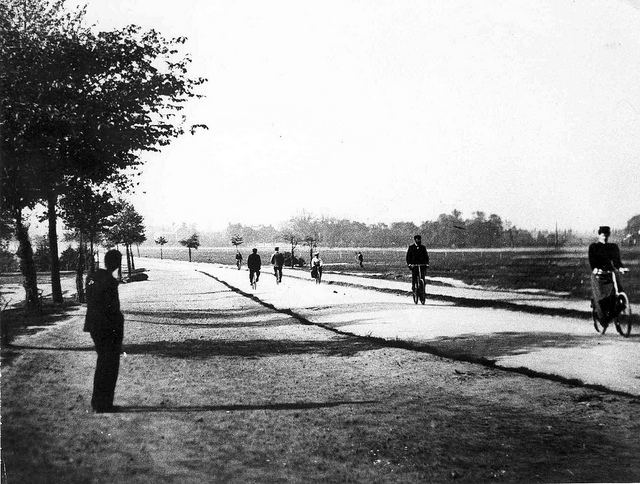 “On a fine Sunday evening thousands of working men, attended by their sweethearts or wives and families, may be seen proceeding along the Mile End Road in the direction of Wanstead Flats, a large open space, perfectly level and covered with verdure, close to the Forest Gate Station of the Great Eastern Railway. The distance from London is not great, the Flats being within five miles of the Royal Exchange, a circumstance adding considerably to the value of this portion of Epping Forest as a popular open-air resort. But it is on Wednesday and Saturday afternoons during the fine days of summer, that the Flats present their most interesting appearance, for on these occasions they form the playground of immense numbers of children from the myriad courts and lanes of Spitalfields, Shoreditch, and other densely populated districts in East London.” The Graphic, July 15th, 1871. Wanstead Flats in East London has been the site of social struggles for over a century. Seen by local people as common land, there was deep resentment when Lord Mornington enclosed 34 acres in 1851-2 with residents of Cann Hall and other commoners attempting to block him in the courts. In 1871 Earl Cowley attempted the same in another part of the flats. A meeting called in protest attracted thousands of people who marched from the meetings to the Flats and tore down the recently erected fences. This agitation led to the inclusion of Wanstead flats in the Epping Forest Act of 1878, seemingly protecting it for perpetuity. However in 1946, both East Ham and West Ham councils made bids to build on the Flats in the southern and eastern parts. This led to a well-supported campaign to save the Flats. West Ham Council passed a Compulsory Purchase Order to build temporary accommodation on the Flats. There was much local concern that this temporary accommodation would end up being permanent, thus eroding the common space of the Flats. A massively supported campaign by the Wanstead Flats Defence Committee led to the eventual withdrawal of West Ham’s application. Again there was much local opposition in 2011-2012 to the building of a temporary police hub for the Olympics on the Flats. All of these events have received some coverage both in print and on the internet. What is less well known is the free speech fight on Wanstead Flats which involved the arrest and imprisonment of local anarchists in 1891-2. This struggle preceded similar free speech fights in Peckham and Manchester in 1893-4. The Conservators (keepers) of the Flats, with their superintendent Major Mackenzie at their head, were intent on enforcing by-laws that prevented free speech on the Flats. Enforcement of these laws seems to have been very lax up to the time that anarchists started speaking there, and many Christian groups has been holding their meetings there for a long time. As Richard Jane remarked at one of his court appearances: “was it not a fact that meetings had been held in Bush Wood for fifteen years without interruption?”. Political prejudice appears to have been in play, but in order to hound the anarchists, the Christians had to be pursued as well in order to maintain the myth of impartiality on the part of the keepers. Thus, an extraordinary and very uneasy convergence of interests developed between the anarchists and the Christians! As the Essex Herald sneeringly commented: “It is a strange state of affairs that brings ‘Anykist Communists’ into line with Christian Evangelists of however lows a type”. The various Christian groups who preached on the Flats did put up resistance to harassment with a result that a large number appeared in court, although all were bound over and did not receive the vicious treatment that the courts meted out to the anarchists. Three weeks after Jane was first summoned he was arrested again. As a local paper reported: “The red flag vagabonds duly put in their threatened appearance, blood coloured banner and all. “ They suspended two lanterns on a pole “technically” on Leyspring Estate, but then marched into Bushwood. Three keepers and seven police were present, including one mounted policeman and six plain clothes cops. The anarchists were “allowed” to speak for a while but the police then closed in. The mounted policeman then rode up to the flag and a keeper demanded the names and addresses of speakers. The paper described the accompanying crowd as being on the side of the speakers, describing them as a “howling and yelling” “mob”. (Chelmsford Chronicle, 25th September 1891) On the same day, the Essex County Chronicle referred to the anarchists as “rowdies”. Previously it had characterised them as “unwashed” (Sept. 11th, 1891). Jane “obstinately” refused to answer the keepers’ questions about his name and address. He was duly arrested and taken to Wanstead Police Station. Fred Goulding was issued with a summons at the same time. Both then appeared at Stratford Magistrates Court on Saturday September 26th 1891. Jane was described as twenty four years old and a bill poster. James Forrest Fulton, Conservative M.P. for West Ham North, was the prosecutor at the trial. He persisted in typifying anarchist ideas as beyond the pale. Interrogating Jane he stated that he believed he called himself an anarchist, to which the latter replied: “That is right”. Fulton replied that he did not know what that was, but supposed it meant having mischievous opinions. Jane received a sentence of two months’ imprisonment doled out by W. W. Glenny, the chairman of the court. As the Chelmsford Chronicle noted Jane had “persisted in expounding his crude and extravagant views on Wanstead Flats” and this was the price he had to pay. Goulding was then arraigned. He stated that he was going to vindicate the right of free speech. He agreed that he had spoken but believed free speech was permitted and that the meetings were outside the boundaries of Bushwood. If they could not speak there, where were they to? They were doing good work, they had a grievance to redress, and they had had no voice in making by-laws and they intended to persist. Fulton asked for a full penalty as a deterrent to others “following in the evil footsteps of the determined to end the violation of the bye-laws “which was accompanied by the pernicious nonsense they persisted in spouting”. Goulding was fined forty shillings and costs, which he said he could not pay, and as a result was sentenced to one month’s imprisonment. He cried out “Long live the social revolution” before being taken down. Comrades clubbed together to pay his fine. A further attempt was made by the anarchists on the following Sunday to speak on the Flats, but this was foiled by the Flats keepers and they spoke on private land adjacent to the Flats. The Essex Newsman reported in its usual bigoted way that an anarchist contingent had appeared on a following Sunday and that “several of the speeches appeared to be comparatively sane”. Mr Oddy’s Temperance Band had also assembled “in some force”. The Essex County Chronicle carries a typically hostile account of developments in its issue of Friday, January 8th, 1892. It describes the attendance of Jane on the Flats after having been recently released from prison. “ ‘Comrade ’icks’ held a meeting on Leyspring Estate to agitate for “the right of free speech in Heppin’ Forest. About fifty people, chiefly boys assembled” (Hicks was a well known speaker for the Socialist League with Commonweal reporting him speaking in many different pitches throughout London). The local press was silent on the situation after this and it appears the agitation had ground to a halt. The local press had engaged in a vicious campaign against the anarchists, characterised by supercilious and prejudiced language, scoffing at their working class accents and questioning whether they had any right to speak (this anti-working class prejudice spilled over into contempt for the local preachers). Jane and Goulding had put up a brave fight in the face of the combined might of the press, police and judiciary and they should be remembered for this. (1) Richard Jane was also involved in the anti-rent/anti-landlord agitation of 1891, speaking on it in Victoria Park alongside Mowbray, Mainwaring etc on July 26th.